If talk radio hosts are a window into what’s on the mind of many right-leaning Americans these days, then it must be true that many are worried socialism is rearing its ugly head again. That is so mainly because Elizabeth Warren, Bernie Sanders, and the now-famous Congressperson from New York (who won't be named here) keep coming up in interviews. It would seem the prominence of Sanders and Warren, including Sanders nearly winning the Democratic presidential nomination in 2016, would give limited government types reason to be concerned. All that, plus on even a cloudy day nowadays, the Congressperson from New York can be seen forever. The question that keeps being asked is whether these developments signal a bleak future. Logic says no. For one, equity markets represent a look into the future. If the U.S. were on a certain path toward 20th-century style socialism, stocks would correct to reflect the embrace of an ideology that arrests progress. That they’re not in freefall has to be indicative of something. 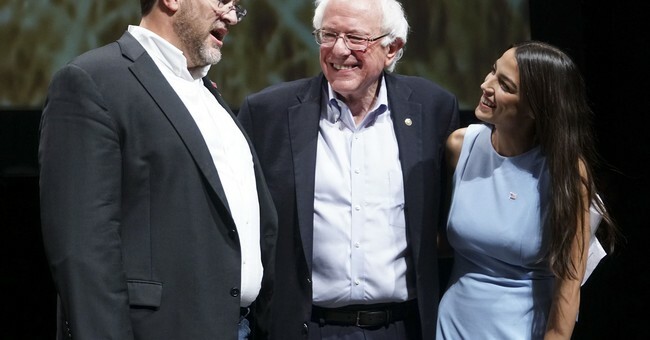 One possibility might be that the Dems' leftward lurch into the socialist camp signals an easy re-election for Donald Trump. With Trump, though he has many weaknesses of the rhetorical and policy variety (his commentary on trade is astounding for how divorced it is from reality), he’s broadly in favor of investor-friendly policies. While the tax cut he signed is vastly overrated by Republicans (any tax bill focused on middle earners is a Keynesian tax cut), it’s certainly true that Trump would have signed a much bigger and better one if the scared-of-their-own-shadow Republicans had delivered it to him. On regulation, it’s worth celebrating that for every new regulation during Trump’s presidency, 22+ have been repealed or allowed to lapse. The dollar hasn’t declined, as Trump and his Treasury have for the most part kept quiet about it. The anti-China rhetoric is scary, the very notion of a trade “deal” screams central planning, but Trump’s desire for a “deal” with China hopefully signals his willingness to not do something too drastic or problematic. All that, plus Trump is polarizing. These presidents are ideal. An old column about Trump cheered the “genius” of doing nothing. Polarizing presidents don’t work well with Congress. Good. The less Congress and the White House get along, the better off we are. But let’s assume the markets haven’t written the Dems off, such that Trump's in trouble in 2020. If so, there’s still reason to be economically optimistic. If commenators like the Wall Street Journal’s Gerald Seib are right, the Democrats are increasingly “a party dominated by higher-educated, higher income voters.” Investor Ken Fisher has observed much the same at USA Today. This truth matters, and it’s an optimistic one. It’s a reminder that the Democratic base includes some of the most accomplished people in the world. That they’re increasingly part of the base is a sign that actual policy from the Dems will never live up to the socialist droolings of some of their brightest lights. Not even close. Democrats aren’t voting that way, and donating that way, so that their wealth-creating genius can be expropriated. After that, the stock market rates mention yet again. As Roger Altman pointed out several months ago in the Wall Street Journal, and this is only a slight paraphrase, “the stock market is more powerful than a nuclear weapon.” Altman’s point was that presidents always face discipline from market signals that will roughly and quickly force them back on track. So while it will surely be gut wrenching for Republicans if Sanders or Warren wins in 2020 in much the same way that it was awful for Dems to stomach Trump’s 2016 victory, markets and divided government realities plainly moderated Trump’s worst instincts. The same will apply to Democratic presidents. The U.S. doesn’t elect dictators despite what partisans on the left and right may think, or wish when their person is in office. Still, the rhetoric of Sanders, Warren et al is disturbing. And wrongheaded. All this talk about dividing up wealth, taxing it away after a certain point, and limiting the ability of individuals to attain great wealth (“a billionaire is a policy failure”) is just so dispiriting. It is, but one optimistic way of looking at it is that it’s the predictable result of prosperity. Socialist demagogues invariably rear their obnoxious, iPhone attached to the ear heads in times of prosperity. Why be socialist where there’s no wealth to redistribute? View Sanders, Warren et al as contrarian indicators. They’re too clueless to realize they’re an effect of wondrous prosperity, and that without the billionaires they disdain, they wouldn’t have voices. Or maybe they’re all too aware of why they're attracting so much media attention. If so, too bad. Because they’re playing the fools. As this column pointed out a few weeks back, no one wants “money.” They want what money can be exchanged for. Sanders, Warren et al keep talking about redistributing wealth, but “money” has no use other than as a medium that can be exchanged for goods and services. Crucial here is that the rich get that way by mass producing at low cost the luxuries that were once only affordable to the very few. Basically the superrich are that way because they’ve achieved the dreams of their Democratic critics, only without guns and force. Billionaires are so much better, and so much more peaceful than those who use them to attain political prominence. Still, if that Congressperson from New York has a big megaphone right now, it must mean lots of brilliant people are creating enormous, life-changing wealth. It’s cause for optimism.